The distribution of the eigenvalues of differential operators has long fascinated mathematicians. Advances have shed light upon classical problems in this area, and this book presents a fresh approach, largely based upon the results of the authors. The treatment is largely self-contained and accessible to non-specialists. Both experts and newcomers alike will welcome this unique exposition. The distribution of the eigenvalues of differential operators has long fascinated mathematicians. 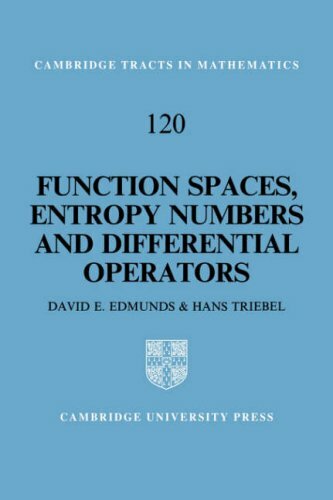 Advances have shed light upon classical problems in this area, and this book presents a fresh approach, largely based upon the results of the authors. 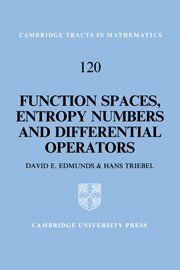 The emphasis here is on a topic of central importance in analysis, namely the relationship between i) function spaces on Euclidean n-space and on domains; ii) entropy numbers in quasi-Banach spaces; and iii) the distribution of the eigenvalues of degenerate elliptic (pseudo) differential operators. The treatment is largely self-contained and accessible to non-specialists. Both experts and newcomers alike will welcome this unique exposition.